The government has approved 14 billion baht for construction of a 32-kilometer extension of Highway 7 running from Pattaya to the Maptaphut industrial estates in Rayong. 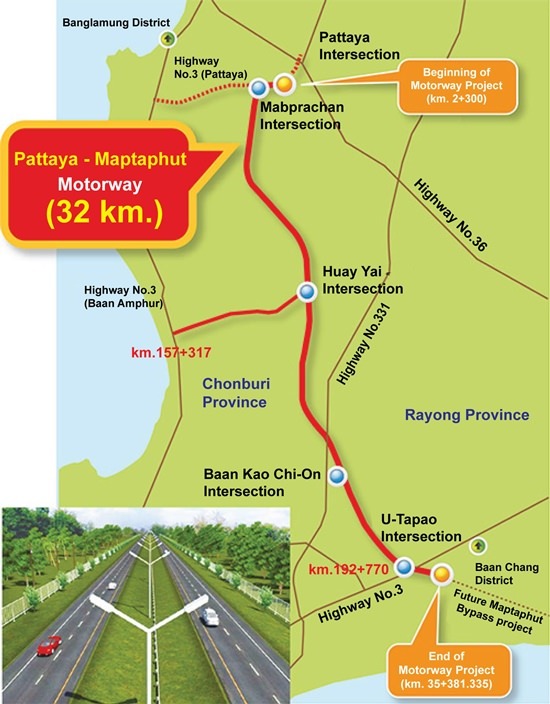 Plans call for the motorway to connect to the Bangkok-Pattaya Expressway at Highway 36 and end at Sukhumvit Road near Ban Chang, with an extension running from Ban Chang to Maptaphut. Construction is expected to run through 2019. The infrastructure initiative is aimed at improving shipment of goods from the Rayong factories to Laem Chabang Port, Chonburi, and other surrounding areas in anticipation of ASEAN Economic Community growth. 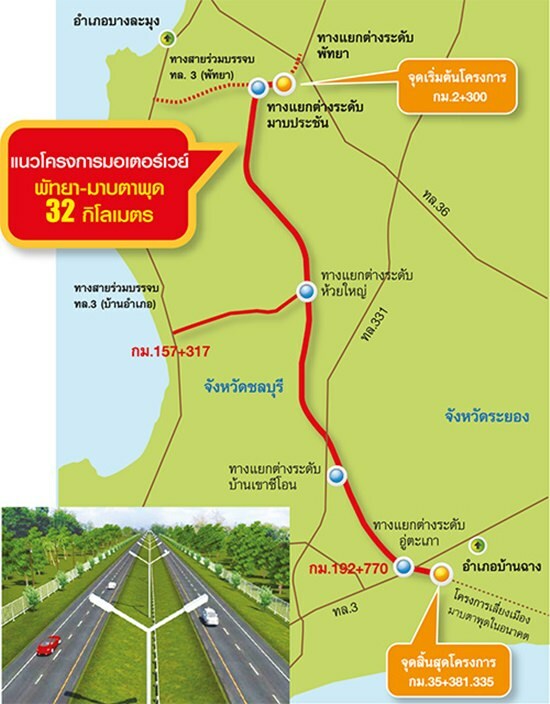 Map of the new Chonburi-Pattaya-Maptaphut motorway. More than 200 rai of land will be needed for the project which runs through two provinces, three districts and eight municipalities. The road will proceed across Banglamung District in a straight line from Highway 36 to Sukhumvit Road in Ban Chang. The highway will measure 80 meters wide, be four lanes across, and have four levels. In addition, the Highway Department will install toll booths at Lad Krabang and Panthong. Fares will then be collected at the end of each segment at 1 baht per kilometer, although initially tolls will be 60 baht until further notice. Three more toll booths are anticipated.